Players and coaches of the Casco Bay Tier II bantams celebrate Feb. 26 after defeating the Maine Freeze 1-0 in the state championship game at the Colisee in Lewiston. Casco Bay advanced to the national tournament March 28-April 1 in Wayne, N.J. 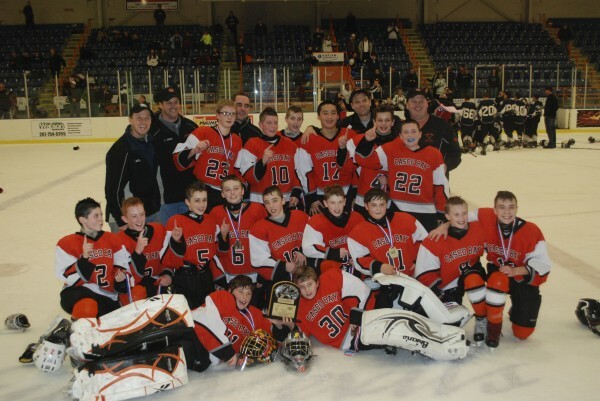 The Casco Bay Peewee Travel A squad from Greater Portland won the Tier II peewees state championship Feb. 25 with a 2-0 victory over the Maine Freeze at the Colisee in Lewiston. Casco Bay players and coaches display their plaque. The Casco Bay will compete in USA Hockey's peewee national tournament March 28-April 1 in Reston, Va.
PORTLAND, Maine — Most of the Casco Bay Hockey Association bantam team that won the national championship last year is headed back to the nationals at the end of the month, except they’re competing at the midget minor level this time. 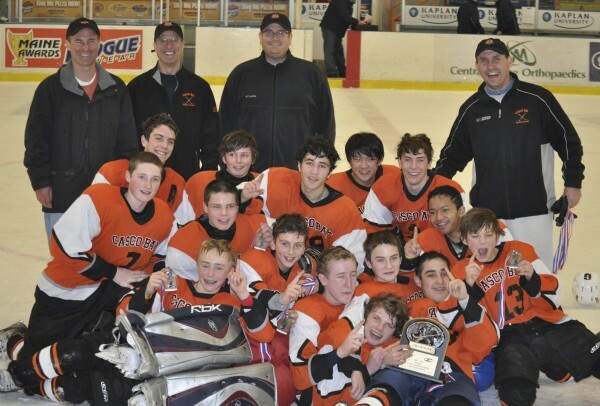 The midget minor (ages 15-16) squad is one of three Tier II teams from Casco Bay that have earned trip to national tournaments March 28-April 1, the most of any youth hockey organization in Maine. Casco Bay covers Greater Portland from Freeport to Cape Elizabeth, playing and practicing at Travis Roy Arena in Yarmouth, Falmouth Family Ice Center and Portland Ice Arena. The midgets’ tourney is in Green Bay, Wis., the Tier II peewees (ages 11-12) are playing in Reston, Va., and the Tier II bantams (ages 13-14) earned a trip to Wayne, N.J. The other state champion boys team, the Maine Moose of Augusta, won the Tier II midget major (ages 17-18) title and will play in Lansing, Mich. The Tier II girls Under-12 and U14 champions from Lewiston play regionals in Rhode Island this weekend, and the Portland Junior Pirates’ U16 and U19 girls teams play in regionals in Connecticut March 16-18. Winners from those four regionals go to nationals in Irving, Texas. The Casco Bay midgets are a close-knit squad, according to vice president David Weatherbie, who is also coach of the peewees. “The top three scorers have been playing together in youth travel hockey since they were mites [ages 6-8],” said Weatherbie, who coached the bantams last year. Those scorers are center Ted Hart and wings Ben Freeman and Sterling Weatherbie (David’s son), and they play on the same line. “The top line really dominated nationals last year,” said Weatherbie. Freeman registered 25 points (goals plus assists) in six games, Sterling Weatherbie had 20 and Hart had 15. While the state championships that determined most of the Tier II teams to go to nationals were held Feb. 25-26, the midget minor and midget major (ages 17-18) states were held in November. That’s because most of them play for their high school teams, and the Maine Principals’ Association policy prohibits playing in both at the same time. “So, many of them have been playing against each other for the last [three] months,” Weatherbie said. Hart plays for Greely High School of Cumberland Center, Freeman for Falmouth and Weatherbie for Cheverus of Portland. They can’t practice together again until next week, after the high school state championships conclude. The goalies are Dane Pauls, who starts for Falmouth, and Kyle Kramlich, who starts for Greely as a freshman. The head coach is former University of Maine captain Peter Metcalf, who was a freshman on the Black Bears’ 1999 NCAA championship team. Their first game is at noon March 28, against Maryland. They will also play Florida, Virginia and Rhode Island. The top two teams in the two pools advance to the semifinals, and the semifinal winners play at 10:30 a.m. April 1. The peewees are understandably excited for a couple of reasons, according to Weatherbie. They’re playing in Division 3A, which is the top group of three and has 16 teams. “They’re the top 16 teams in terms of skater population in the 40 states [with hockey associations],” said Weatherbie. The teams are divided into American and National pools. The Maine representative will take on Western Pennsylvania, Connecticut and Michigan. The top four from each eight-team pool qualify for the quarterfinals March 31, the semis are that night and the final is at 9 a.m. April 1. “It’s a significant problem but one we’re not backing down from as a team,” Weatherbie said. It has been a long road for the peewees, and the bantams as well. Casco Bay made progress throughout the season, according to Weatherbie, and finished second to the Gladiators in the travel league. But they lost to the fourth-seeded Maine Freeze 1-0 in the first state tourney game. They won their next two, though, and earned the right to face the Freeze again in the state final, which Casco Bay won 2-0 with two third-period goals. Casco Bay has five forwards — Bill Jacobs, Dominic Tocci, Andrew Ray, Henry Norris and Andrew Keith — with more than 25 goals each. They cover all three lines. But he sees defense as his team’s strong suit. “We only allow about 1.5 goals per game,” Weatherbie said. The goalies are Peter Haber and Spencer Pierce and they alternate games. The defensemen are a factor, too. The bantams were struck by turmoil early in the season. So they started looking for replacements. “We had to call around to the house teams,” Grant said. Ross LeBlond, son of Cape Elizabeth High School coach Bill LeBlond, answered the call. In fact, he was the only one. Where almost every team has two goalies, Casco Bay played all season with one. The team, coached by Peter Sellwood, is young, according to Grant, with seven first-year bantams on the 15-player squad. “We win games by playing pretty smart and working hard,” Grant said. “[In the state final] we scored a shorthanded goal with 2½ minutes remaining. That’s the way our season has gone. And they’re going to have to go a longer way, too, in the tournament, Grant said. Youth games in Maine have three 12-minute periods. At the nationals, they’re 16 minutes. Because several of the second-year bantams, including four of the five defensemen, made their high school varsity or JV teams, they often had practices with only seven or eight players. But that helped the younger players improve, a key to the team’s success. Casco Bay, also playing in Division 2A, opens against Vermont at 11:15 a.m. March 28. They will also play Arizona and North Carolina before the top four teams in each pool go into the playoffs. The final is at 1 p.m. April 1. The team features speed up front but not size; the defensemen are strong. Goalie play has to be strong, too, because goal-scoring is a problem. They scored 37 goals in regular-season league play. “We have small room for error,” Grant said.